For most new parents, life becomes a steady routine of dirty nappies and sleepless nights, but one couple decided to make the most of their 10 month maternity leave, by taking their 10 week old baby on a trip around the world. Before their baby was three months old, Karen Edwards and Shaun Bayes had rented their London home, sold their car, boxed away their belongings, packed one backpack and boarded a plane. To make the trip a reality, Shaun was forced to leave his job as a landscape gardener, whilst Karen took her 10 month maternity leave from her nursing job. Since they first departed, the family have visited Singapore, Australia, Indonesia, Malaysia, Vietnam, Taiwan, and Hong Kong. According to Karen, the once in a lifetime trip apparently cost £10,000, which was funded by savings, landscape gardening jobs in New Zealand and her maternity pay. The couple saved money by using air miles collected on their previous backpacking trips, and booking their flights months in advance. Now back home, the family are already planning their next trip, which will involve visiting Thailand, Cambodia and New Zealand. According to the couple, their first trip was a breeze, because their baby was so well behaved and easy to transport. However, now that Esme is 17 months old, they are finding it harder and harder to keep her amused – hence the new trip plans. The doting parents made sure that baby Esme was protected during the trip, by breastfeeding and getting her travel vaccinations in the UK and New Zealand. 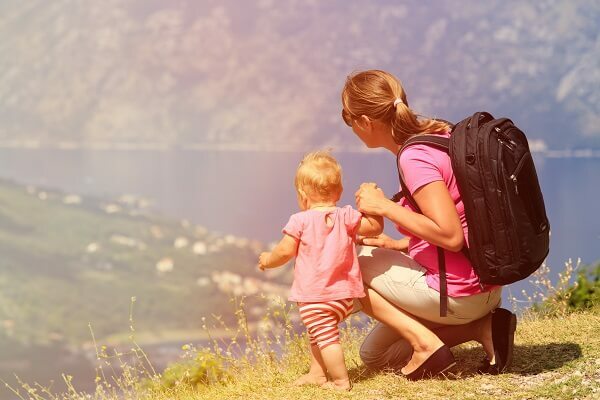 If you’re planning a family adventure, just make sure you invest in family travel insurance before you depart.